Most InsuranceNewsNet readers are selling products traditionally associated with insurance. However, our higher-earning readers tended to have practices that are more hybrid, selling financial products in addition to insurance. That was one of the more interesting observations we derived from a poll of InsuranceNewsNet readers in October. 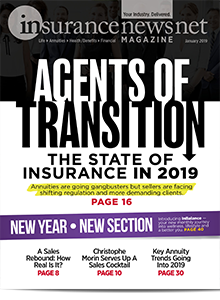 It is clear that life insurance is still the producers’ bread and butter, with the highest percentage of INN readers (81 percent) reporting that they sell term life. Other life insurance products followed term life as the most popular products sold by INN readers, with 51 percent selling universal life, 46 percent selling whole life and 45 percent selling indexed universal life. After those life insurance products came the first mention of annuities, with 42 percent of readers selling fixed index annuities. The next most popular annuity was traditional fixed, coming in at No. 8 with 28 percent of readers selling it. 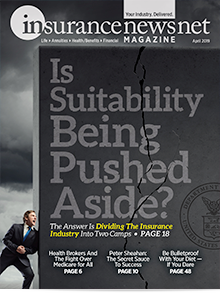 Health-related products follow FIAs in reader popularity, with 30 percent of readers selling long-term care insurance, 29 percent selling disability insurance and 27 percent selling individual health coverage. The product lineup is similar when comparing the lower earners — those making less than $100,000 annually — with higher earners who were making more. However, some key differences between the two income groups emerged. The higher-earning producers tended to sell more life insurance and annuities than did the lower-earning group. Meanwhile, the lower-earning group sold a higher percentage of health products than did those in the higher-earning bracket. The four top-selling life insurance products were the same for each group, but the percentage of those products sold by the lower-earning group trailed the higher-earning group by an average of 10 points. The difference becomes starker when looking at annuity sales. Among the higher earners, 46 percent sold FIAs, compared with 39 percent of the lower earners. Where traditional fixed annuities were concerned, 36 percent of the higher-earning group sold them, compared with 20 percent of the lower-earning group. 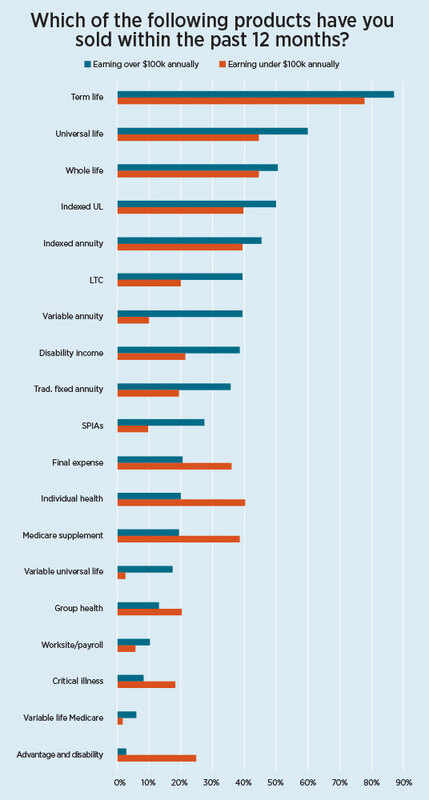 Single-premium immediate annuities were sold by 27 percent of the higher earners and 10 percent of the lower earners. 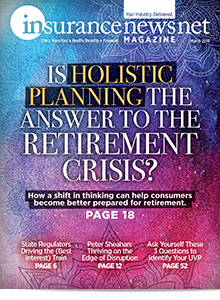 The sales of traditional annuities and SPIAs point to readers using them for income and retirement planning for their clients because these products tend to be used for the income stream and tax advantages they offer. Health insurance tends to be less lucrative than other insurance sales, but there were differences in the type of market served by the two earner groups. The higher earners tended to sell long-term care and disability by a larger margin, which may indicate that this group of advisors uses the supplemental products as income protection in their overall planning for clients. Variable annuity sales were where the greatest difference between the two groups of advisors showed up. Forty percent of the higher earners reported selling VAs, compared with 10 percent of the lower earners. The gulf was not as great for variable universal life — sold by 18 percent of higher earners versus 4 percent of lower earners — but still significant. The difference between the two groups also is reflected in the licensing that allows the sale of variable products, with more of the higher earners holding those licenses. Speaking of licenses and designations, a greater percentage of the higher earners held a Series 6 or 7 license. The Series 6, which allows the sale of variable products, was held by 43 percent of the higher earners and 17 percent of the lower earners. The Series 7, which also allows the sale of other securities, was held by 38 percent of the higher earners and 8 percent of the lower earners. Only a few of the lower earners (7 percent) said they expected to get a Series 6 or 7 in the next five years. By the way, the difference was clear at the top of the range. Of producers making more than $200,000 annually, half of them had a Series 7, which requires what is considered the most difficult of the securities exams. The spread between the under- and over-$100,000 groups is wider for producers who collect fees. 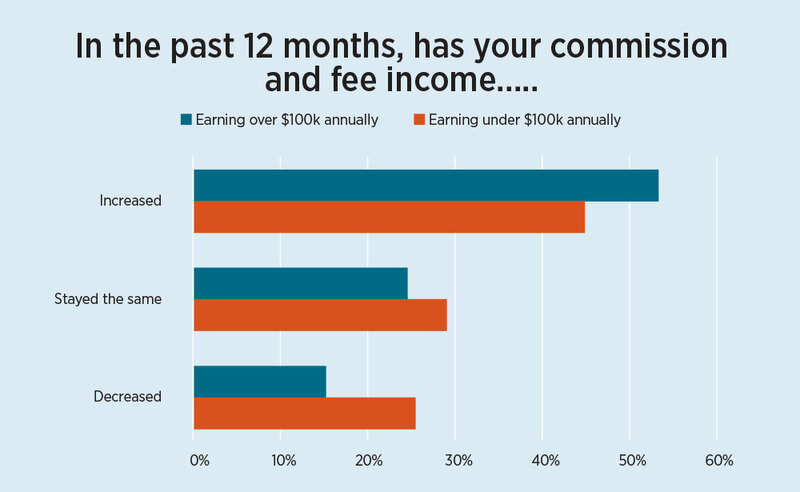 Of the higher earners, 60 percent expect to derive some income from fees next year, versus 30 percent of the lower earners. The margins between the two earnings groups were closer when it comes to readers who hold insurance designations, such as Life Underwriter Training Council Fellow or Chartered Life Underwriter. However, here again, a higher percentage of the higher earners held such designations. Another wide difference between the two earning groups was membership in professional organizations — one association in particular. Substantially more of the higher earners — 37 percent — belonged to the National Association of Insurance and Financial Advisors (NAIFA), compared with 19 percent of the lower earners. 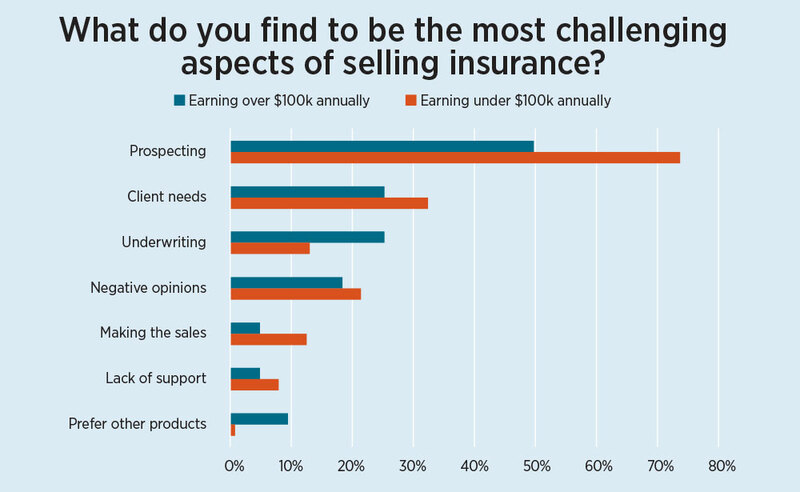 Prospecting is by far the most difficult aspect of selling insurance, according to the advisors who responded to the survey. But here again, members of the two income groups experience this difficulty in different ways. The over-$200,000 group’s response to their greatest sales challenge was intriguing. Although prospecting was still the leading challenge for this group, it was named by only 36 percent of them. 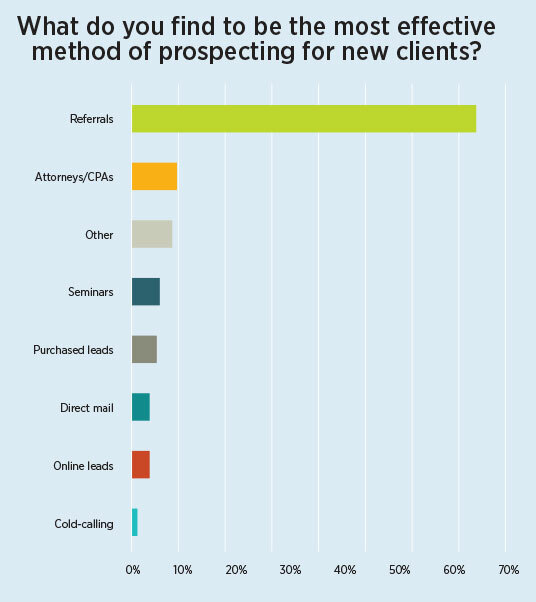 But “clients don’t recognize need,” was a close second, cited by 32 percent. The two underwriting concerns also were named by 25 percent of the over-$200,000 group. But even though prospecting was named as the top sales challenge by all of the groups, not many of them are spending an enormous amount of time on prospecting. Of the under-$100,000 crowd, 61 percent spend less than 25 percent of their time prospecting; 37 percent spend less than 10 percent of their time on it. For the higher earners, that climbs to 77 percent saying they spend less than 25 percent of their time prospecting. 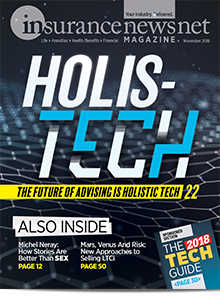 That climbs further still for the over-$200,000 crowd, with 84 percent saying they spend less than 25 percent of their time prospecting, and 39 percent say they spend less than 10 percent of their time hunting new clients. Everybody agreed by a huge margin that referrals are the best way to prospect, with 65 percent of the lower earners, 61 percent of the higher earners and 70 percent of the over-$200,000 group favoring referrals. But the second-place methods of prospecting were very distant, and very different among the earning groups. The lowest-earning group bought leads (9 percent). The higher-earning group used “strategic alliances with attorneys, CPAs or other financial professionals” (11 percent). The over-$200,000 crowd used seminars (11 percent). It’s clear that prospecting is part of everybody’s future, but of course to different degrees. 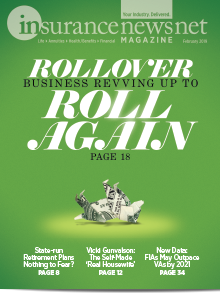 Of the lower-earning group, 66 percent said at least 75 percent of their business comes from new clients; of the over-$100,000 group, 48 percent said 75 percent of their business is new. That drops to 43 percent for the over-$200,000 crowd. Time is money — at least the time correlated with income. It is often said that it’s best to work smarter rather than longer. These folks are smart (we’ll see that in a bit), but they are also putting in long hours. Of the lower-earning group, 42 percent spent more than 40 hours a week working at their insurance/financial profession, with 3 percent spending more than 60 hours weekly. The higher earners were more likely than their lower-earning peers to burn the midnight oil at work. Of the over-$100,000 set, 59 percent did more than 40 hours a week, with 11 percent exceeding 60 hours weekly. Of the over-$200,000 crowd, 63 percent did more than 40 hours weekly, with 11 percent topping 60 hours a week. The adage “The more you learn, the more you earn” also rang true for our readers. The survey indicated that education levels seem to correlate with income. Of the lower-earning group, 28% had less than a bachelor’s degree. Of the higher-earning group, 23 percent had less than a bachelor’s, and of the top-earning group, it was 12 percent. Members of all the groups have put in their years. 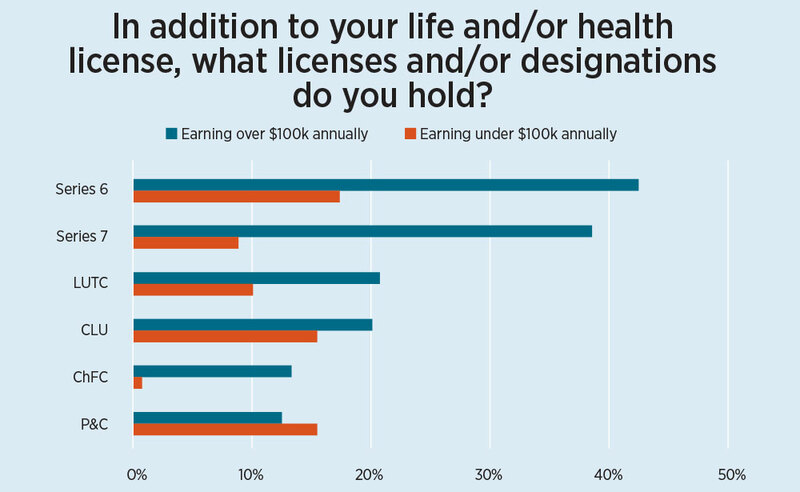 Of the lower-income group, 81 percent had an insurance license for at least 10 years, with 42 percent holding one for more than 20. Among the over-$100,000 group, 98 percent held a license for more than 10 years, with 71 percent of this group having been licensed for more than 20 years. All of the producers in the over-$200,000 group had their licenses for more than 10 years, with 75 percent of them licensed for more than 20 years. But besides spending time in their work and careers, the higher earners clearly had a different kind of business. Of the lower earners, 57 percent worked out of their home. More than half of them — 52 percent — were the lone employee in their practice. But only 22 percent of those in the over-$100,000 group worked out of their residence. The largest percentage in that earning group, 44 percent, worked in offices with two to five people. Of the over-$200,000 producers, only 6 percent worked out of their home, and 39 percent worked with two to five people. The different business models were reflected by the expenses incurred by the different earning groups as well. Marketing was named as the top expense for the lower-earning group, with 34 percent of this group naming it their top expense. Employee salaries were the biggest expense for the higher earners, cited by 39 percent of the over-$100,000 group and more than half (51 percent) of the over-$200,000 producers. A majority of producers across all the earnings were the owners or principals of their agencies. 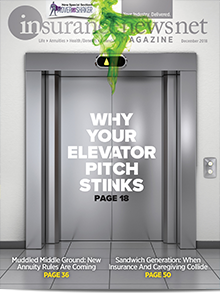 Of the lower-earning group, 75 percent owned their agencies. Of the higher earners, 79 percent owned their agencies. 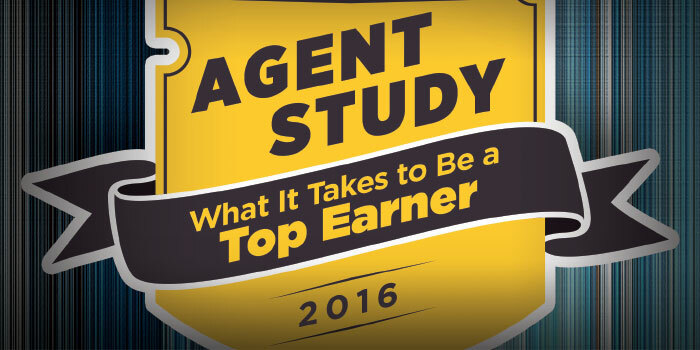 Among the top earners, 77 percent were the agency owners. Many of the owners and principals don’t have succession plans in place despite the fact that a large majority of them have been in business for more than 20 years. Of the lower-earning group, 65 percent said they have no succession plan. In the higher-earning group, 48 percent had no plan, while 35 percent of the top-earning group are without a plan. The different income ranges seem to fall in line with certain business models. Those making less than $100,000 tended to work out of their homes by themselves. They tended to be focused on life insurance, with a good amount of health insurance thrown in. Once producers crossed the $100,000 line, they tended to be working in an office, usually with a small staff of up to five people. They also put in long weeks, with many going past 60 hours. The members of this group also tended to hold other licenses, particularly ones that allowed them to sell variable products and other securities. But one of the more intriguing findings in the survey was that term life was the most commonly sold product, followed by other stand-by forms of life insurance. The top earners also get involved with industry groups, especially NAIFA. Along with their insurance and securities licenses and at least a bachelor’s degree, they tended to have at least a few designations, such as a CLU. The survey seems to bear out what many observers say about an insurance career: You earn what you learn, and you get what you give.